excipients: microcrystalline cellulose, lactose monohydrate, calcium hydrogen phosphate, povidone, talc purified, magnesium stearate, aerosil 200. Trihexyphenidyl hydrochloride is an anticholinergic agent. It is an antispasmodic drug which exerts a direct inhibitory effect on the parasympathetic nervous system. It diminishes salivation, increases the heart rate, dilates the pupils and reduces spasm of smooth muscle. Trihexyphenidyl hydrochloride is well absorbed from the gastrointestinal tract. It disappears rapidly from the plasma and tissues and does not accumulate in the body during continued administration of conventional doses. Trihexyphenidyl is an antispasmodic drug which exerts a direct inhibitory effect on the parasympathetic nervous system. 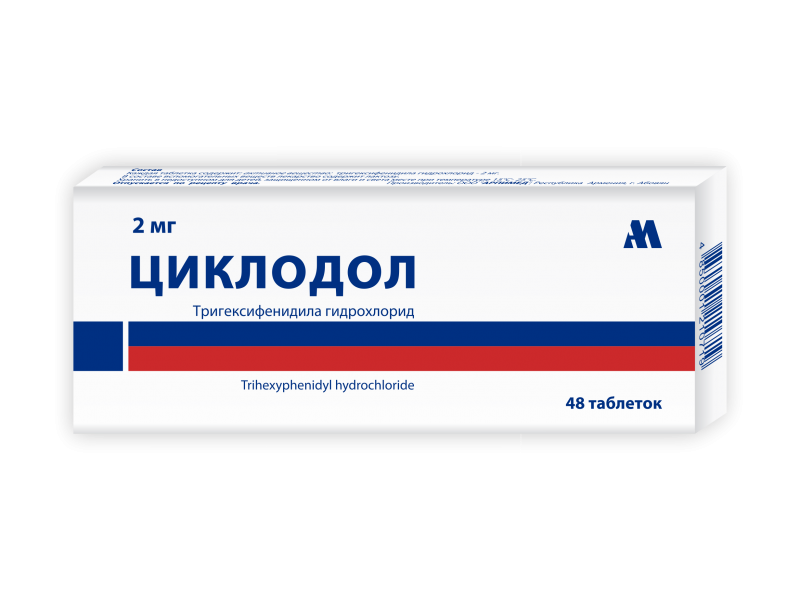 It also has a relaxing effect on smooth muscle.It is indicated in all forms of Parkinsonism (postencephalitic, arteriosclerotic and idiopathic). It is often useful as adjuvant therapy when treating these forms of Parkinsonism with levodopa. Trihexyphenidyl is effective in reducing the rigidity of muscle spasm, tremor and excessive salivation associated with Parkinsonism. Trihexyphenidyl is also indicated to control extrapyramidal disorders (eg akathisia manifested by extreme restlessness and dyskinesia characterised by spastic contractions and involuntary movements) due to central nervous system drugs such as reserpine and the phenothiazines. Posology and method of administrationAdults only: Optimal dosage should always be determined empirically, usually by initiating therapy at a relatively low level and by subsequent graduated increments. The usual dosage for Parkinsonism is 6-10mg per day although some patients chiefly in the post-encephalitic group may require an average total dose of 12-15mg daily. It should be given orally either three or four times a day at mealtimes. Normal dosage for drug-induced Parkinsonism is usually between 5mg and 15mg per day, although some cases have been controlled by 1mg daily. In all cases, trihexyphenidyl dosage should be increased or decreased only by small increments over a period of several days. In initial therapy the dose should be 1mg the first day, 2mg the second day with further increases of 2mg per day at three to five-day intervals until the optimum dose is reached. If patients are already being treated with other parasympathetic inhibitors, trihexyphenidyl should be substituted as part of the therapy. When trihexyphenidyl is used concomitantly with levodopa the usual dose of each may need to be reduced. Careful adjustment is necessary, depending on side effects and the degree of symptom control. Trihexyphenidyl dosage of 3-6mg daily in divided doses, is usually adequate. Trihexyphenidyl may be taken before or after meals according to the way the patient reacts. If trihexyphenidyl tends to dry the mouth excessively, it may be better to take it before meals, unless it causes nausea. If taken after meals, induced thirst can be allayed by peppermint, chewing gum or water. Treatment of drug-induced extrapyramidal disorder: The size and frequency of dose of trihexyphenidyl needed to control extrapyramidal reactions to commonly employed tranquillisers, notably the phenothiazines, thioxanthenes, and butyrophenones must be determined empirically. The total daily dosage usually ranges between 5 and 15mg, although in some cases, these reactions have been controlled by as little as 1mg daily. Satisfactory control may sometimes be more rapidly achieved by temporarily reducing the dosage of both drugs until the desired ataractic effect is retained without concomitant extrapyramidal reactions. It is sometimes possible to maintain the patient on reduced trihexyphenidyl dosage after the reactions have remained under control for several days. Since these reactions may remain in remission for long periods after discontinuation of trihexyphenidyl therapy, such therapy should be of minimal duration and discontinued after symptoms have subsided for a reasonable period of time. Elderly: Patients over 65 years of age tend to be relatively more sensitive and require smaller amounts of the drug. Modern clinical data required to determine the frequency of undesirable effects are lacking for trihexyphenidyl. Minor side effects such as dryness of mouth, constipation, blurring of vision, dizziness, mild nausea or nervousness will be experienced by 30-50% of all patients. These reactions tend to become less pronounced as treatment continues. Patients should be allowed to develop a tolerance using the smaller initial dose until an effective level is reached. Psychiatric disorders: Nervousness, restlessness, confusional states, agitation, delusions, hallucinations, insomnia, especially in the elderly and patients with arteriosclerosis. The development of psychiatric disturbances may necessitate discontinuation of treatment. Euphoria may occur. There have been reports of abuse of trihexyphenidyl due to its euphoric and hallucinogenic properties. Impairment of immediate and short-term memory function has been reported. Worsening of myasthenia gravis may occur. Eye disorders: Dilatation of the pupils with loss of accommodation and photophobia, raised intraocular pressure. Respiratory, thoracic and mediastinal disorders: Decreased bronchial secretions. Gastrointestinal disorders: Dry mouth with difficulty swallowing, constipation, nausea, vomiting. Skin and subcutaneous tissue disorders: Flushing and dryness of skin, skin rashes. Renal and urinary disorders: Urinary retention, difficulty in micturition. Precautions: Since the use of trihexyphenidyl may, in some cases, continue indefinitely, the patient should be under careful observation over the long term. It should be administered with care to avoid allergic or other untoward reactions. Except in the case of vital complications, abrupt discontinuation of the drug should be avoided. Incipient glaucoma may be precipitated by para-sympatholytic drugs such as trihexyphenidyl. Hypertension, cardiac, liver or kidney disorders are not contra-indicated, but such patients should be followed closely. As trihexyphenidyl may provoke or exacerbate tardive dyskinesia, it is not recommended for use in patients with this condition. Trihexyphenidyl should be used with caution in patients with glaucoma, obstructive disease of the gastro-intestinal or genito-urinary tracts, and in elderly males with possible prostatic hypertrophy. Since trihexyphenidyl has been associated with the clinical worsening of myasthenia gravis, the drug should be avoided or used with great caution in patients with this condition. Since certain psychiatric manifestations such as confusion, delusions and hallucinations, all of which may occur with any of the atropine-like drugs, have been reported rarely with trihexyphenidyl, it should be used with extreme caution in elderly patients (see Dosage and Administration). Warnings: Trihexyphenidyl may be the subject of abuse (on the basis of hallucinogenic or euphoriant properties, common to all anti-cholinergic drugs) if given in sufficient amounts. Contains lactose monohydrate. Patients with rare hereditary problems of galactose intolerance , the Lapp lactose deficiency or glucose-galactose malabsorption should not take this medicine. Can cause blurring of vision, dizziness and mild nausea. Also mental confusion in some cases. Pregnancy: There is inadequate information regarding the use of trihexyphenidyl in pregnancy. Animal studies are insufficient with regard to effects on pregnancy, embryonal/foetal development, parturition and postnatal development. The potential risk for humans is unknown. Trihexyphenidyl should not be used during pregnancy unless clearly necessary. Lactation: It is unknown whether trihexyphenidyl is excreted in human breast milk. The excretion of trihexyphenidyl in milk has not been studies in animals. Infants may be very sensitive to the effects of antimuscarinic medications. Trihexyphenidyl should not be used during breast-feeding. Hypersensitivity to trihexyphenidyl or any of the other ingredients. Symptoms: Symptoms of overdose with antimuscarinic agents include flushing and dryness of the skin, dilated pupils, dry mouth and tongue, tachycardia, rapid respiration, hyperpyrexia, hypertension, nausea, vomiting. A rash may appear on the face or upper trunk. Symptoms of CNS stimulation include restlessness, confusion, hallucinations, paranoid and psychotic reactions, incoordination, delirium and occasionally convulsions. In severe overdose, CNS depression may occur with coma, circulatory and respiratory failure and death. Treatment: Treatment should always be supportive. An adequate airway should be maintained. Diazepam may be administered to control excitement and convulsions but the risk of central nervous system depression should be considered. Hypoxia and acidosis should be corrected. Antiarrhythmic drugs are not recommended if dysrhythmias occur. Extra care should be taken when trihexyphenidyl is given concomitantly with phenothiazines, clozapine, antihistamines, disopyramide, nefopam and amantadine because of the possibility of increased antimuscarinic side-effects. Synergy has been reported between trihexyphenidyl and tricyclic antidepressants, probably because of an additive effect at the receptor site. This can cause dry mouth, constipation and blurred vision. In the elderly, there is a danger of precipitating urinary retention, acute glaucoma or paralytic ileus. Monoamine oxidase inhibitors can interact with concurrently administered anticholinergic agents including trihexyphenidyl. This can cause dry mouth, blurred vision, urinary hesitancy, urinary retention and constipation. In general, anticholinergic agents should be used with caution in patients who are receiving tricyclic antidepressants or monoamine oxidase inhibitors. In patients who are already on antidepressant therapy the dose of trihexyphenidyl should be initially reduced and the patient reviewed regularly. Trihexyphenidyl may be antagonistic with the actions of metoclopramide and domperidone on gastro-intestinal function. The absorption of levodopa may possibly be reduced when used in conjunction with trihexyphenidyl. Trihexyphenidyl may be antagonistic with the actions of parasympathomimetics. 1 blister packet with 40 tablets in the cardboard box.